"Doctor Who: The End of Time, Part 1" - the first half of David Tennant's farewell to the role - airs tomorrow in the UK and then Saturday night at 9 on BBC America. I haven't seen it in advance, but I do have the transcript of an interview I did with Tennant at press tour back in late July, in which he looks back on his early days in the role, how his Doctor wound up wearing sneakers, how a childhood of pretending to be The Doctor turned out to be very useful when he got to play the role for real, and a lot more. So read it after the jump, and whether you live in the UK or have, um, some means of accessing the episode after it airs there, please refrain from discussing "End of Time" until after I've seen it and posted about it, either Saturday night or sometime Sunday. Any comments referencing the content of the movie in any way will be deleted. I'm not quite sure what decisions I made and what just occurred. Somewhere in between making a decision and going with the flow, you end up with a performance. One of the differences between your character and (The Ninth Doctor) was that you were both sunnier and darker. You could get very angry. Was that something that was on the page when you were starting? It's how I was interpreting what was on the page, certainly, but I dare say a different actor would have done it very differently. It's one of those characters that is open to personal interpretation in a way other characters might not be. Because he can sort of be anything. You have to just kind of see how it fits with you, I suppose. I love Russell (T. Davies)'s writing, and I respond to it very keenly. I had just done "Casanova," which he had written, and they felt in some ways like very similar characters. I mean, The Doctor does less shagging, but there's a brio, and there's a kind of passion for adventure which I think is similar in both characters. So I possibly brought some of that with me. And the way Russell writes both characters, there's an enjoyment of language and of thought colliding with each other faster than the speed of thinking. Which I've always liked. I like that kind of writing. I'm a big fan of "The West Wing," and the way Aaron Sorkin writes those people who can think and speak faster than the synapses can flash. I love characters who are clever and smart, and you have to run to catch up with. I think there's something very appealing and rather heroic in that. So it made sense that The Doctor should be like that, to me. How much input did you have into things like the look? The look was something that myself and the costume designer worked on hand in hand. Russell and Phil (Collinson), our producer, and Julie (Gardner), our exec producer, they would all have an opinion, but basically, Louise Page and I worked it out between us, and threw ideas back and forward and came up with 'the look' - which, again, from the minute you take over is what you're being asked about. And that's quite tricky, because it has to be of its time and yet timeless. And I always wanted a long coat. To me, it feels like The Doctor has to have a long coat, and that's something imprinted on me from childhood, because he always did. And there's something heroic in a flapping coat, but at the same time, I need to get rid of it sometimes and just be a scrawny guy in a suit that doesn't quite fit. So there was a sense of authority to him, but it's undermined by his own carelessness. He wears a suit, but doesn't wear it with proper shoes. Something about that felt right. But, again, we arrived at it slightly by accident. And it has to be something you can run around in and wear every episode. Absolutely. I was very keen on soft shoes. That was something I was always adamant about. That was the closest Louise and I had to a disagreement, and I was determined. In the first few episodes, they're my own shoes, because I wanted them to be old and battered and lived-in and falling apart. So until they did fall apart, I used my own shoes. And then, at the point when they didn't have any soles left, we got some new ones. For me, they were never as good again. I love when they were actually falling off my feet. Someone asked me if you got to keep a pair. The ones that were mine, we actually ended up selling for charity. So I don't know who's got them now. But I do have a couple of the pairs we used on the show. But there were hundreds of them. When you're working with Billie (Piper), who'd had a pre-existing relationship with the other Doctor, how do you approach that as an actor, in terms of his feelings for her? That could have been very tricky, because Billie would have every right to feel it was her patch. But mercifully, because Billie is so generous and so lovely, and such a great actress and wonderful human being, frankly, it was such a joy to work with her, and such a pleasure. Dramatically, that's what's going on between the characters, because she's having to rediscover this new man who's the same man she knew, and how she feels about that. But very quickly, I think we established that relationship that they had was as deep, and ran even deeper ultimately. That's one of the things I've always wondered about the franchise: does The Doctor have the same feelings for people and things that he did before he regenerated? Does he have the same feelings for Sarah Jane that he did in the '70s? Not necessarily, but with Rose, he certainly did. Meeting Sarah Jane again was deeply moving for him, I think. And what was interesting there was, he, in a sense, has gotten younger. That's The Doctor's eternal problem: he will always outlive his earthbound friends. And that's a great dramatic opportunity that you don't get in normal drama. You've got this character who's virtually immortal, certainly in terms of anyone from Earth, and how does that impact on those relationships? Even within a fantasy action/adventure scenario, you get to play these wonderful emotional beats. It's unlike anything else. Patrick Stewart (with whom Tennant recently co-starred in a London production of "Hamlet") has talked about how one of the reasons he keeps being asked to play these iconic science fiction characters is that the training that he has through Royal Shakespeare allows him to give it a gravity and a reality, so it's not just silly men in funny suits. Well, there's a similar trick - "trick" is underplaying it a bit - to playing Shakepseare and to playing this kind of work: you've got to play it absolutely real. But the language of Shakespeare is slightly heightened, and you have to serve it up. And there's a similar thing to that science-fiction/fantasy stuff, and you have to absolutely ground it in veracity, and yet just serve it up a little bit. I completely get what Patrick says, and I'm sure Ian McKellen might admit to a similar thing. If you can sell that you're the King of Scotland, or Henry V on a tiny stage in a studio theater somewhere, then you can probably sell that you're a starship captain or a time traveler. There is a similar skill there, yeah. Obviously, when the two of you were working together, you had larger concerns in mind. But was there ever a point where you were able to talk about your shared experience? We did a bit. He had recently acquired his Star Trek costume after spending years thinking he wasn't going to get it, and I was hoping for mine to arrive, so we talked about that. Of course, it's been a huge part of Patrick's life and my life - as has the Royal Shakespeare Company. How was it to film your last scene as The Doctor? Emotional. Thrilling, because the scripts are so exciting. You finally get - this character that we do manage to explore, an emotional life for The Doctor that you might not necessarily expect. Essentially, he has to remain unchanged at the end of each story that the series carries on - but when you get to the point where this version of the character is going to die and he knows he's going to die, the sands of time are running out and the bell is tolling and all those metaphors, you get to take this immutable character to mutable places, and that's very exciting. And emotional, as well. The character's coming to the end of his life, you're coming to the end of your life on the show, which has been all-consuming. Particularly back home, but all over the world, it's a huge deal. It's very important to people, and particularly to me, all of my life. So to be moving on from that - and I know I'll never say goodbye to it entirely; I'm sure The Doctor will travel with me as long as I'm on this earth - that's very moving and emotional, and it was to film it. I assume you've had some conversations with some of your predecessors about this experience. Did they have any advice? Or thoughts on what it was like for them? Just that it never really goes away. That it's so loved, you can try to get away from it, but you never will. That's to be embraced, not fought. But I'm still too close to it to really know. Maybe I'll need to be around when the next series starts transmitting before I really know how I feel to have moved on. And I feel hugely privileged to have been one of eleven. I imagine that, having been a fan of the show as a child, it must be like growing up as a football fan and suddenly you get to play for your club. I think it probably is very similar. And it's a weird mixture of emotions, because it's such a thrill, and completely surreal to believe you've ended up in this position. And then you get on set, and there's a job to do, and you have to just knuckle down and do it. You can't get too bothered about how absurd it is that you've ended up in this position. But it's still hugely thrilling. The peripherals that come with it are very weird: to be on a comic strip, to be a plastic figurine, to be on a t-shirt, and a cake and whatever else it is. They make everything now! They make soap, and anything you can care to think of. That's weird. That's not something you're prepared for at drama school, that whole side of it. Being a merchandisable commodity is peculiar. But a wonderful experience to have had. Is this something that, as a child, you had ever fantasized about: 'One day I could be The Doctor'? Yes, but never realistically. Never really. It was a sort of whim. Because, like, there are only 11 of us. I was much more likely to play Hamlet than I was to get to play The Doctor. And both of those were pipe dreams. There's only 11 of us, only 8 of us alive who have had that honor. It's a giddy reality to confront. Were there certain parts of it that were either exactly as you might have imagined, or not at all as you had imagined? Like being in the TARDIS? Being in the TARDIS never stopped being a thrill. It's such a wonderful set, and such an iconic thing. Anytime you did start to get blase about it, there'd be a new guest member of the cast who would come and get thrilled with it again. We all grew up with it. It's part of our race memory. You'd always be reminded, when someone new came on the show, how exciting it was. Everyone wanted to be photographed in the TARDIS, or to show their kids, or grandchildren - and, frankly, to be in it themselves. Everyone wanted to be by the TARDIS console, and with their arm around the Dalek. And playing a scene opposite a Dalek or a Cyber-Man, that's got to be quite surreal for you as well. Quite surreal - but really cool! The Daleks particularly. They have these operators inside of them, and they manage them so adeptly. And we have the voice on set - Nick Briggs - and it's wired up with cables, so the lights light up as he speaks. They happen, right there in front of you, all at once. Playing a scene with a Dalek, you can really immerse yourself in that reality. Some of the monsters are CGI or green-screen, and others are rubber head there, elements added afterwards, but the Daleks are live in front of you, happening. But there was never, early on, a case of it being hard to focus on the acting because, "Hey, I'm in a scene with a Dalek"? I'd say the opposite of that. Because if your formative experiences are pretending to do that on the playground, it's remarkably easy to just access that fantasy life again. I don't think that's underselling the process of acting. It's just an easier fictional world to surrender yourself to, because childhood memories are so potent. When you're being paid and allowed to, you can give yourself over to the fantasy very easily. One of the themes, going back to "The Christmas Invasion," is that your Doctor can be a very destructive force. Donna says he needs to be controlled and all that. Is he a good guy? Is he a bad guy in your mind? A mix of things? Something more complicated? It's complicated. He's had some very difficult experiences, with the Time War that we hear snatches of. He was clearly there when his own people perished. That left him with emotional scars, and he does have this tendency - there seems to be a slightly alarming tendency to bloodlust, in there somewhere. It's quite well repressed. He's basically morally pure and righteous, but there's a possibility of hubris in there. And that's something we will explore in these final stories. There's an Achilles heel there that he isn't entirely resistant to. Well, speaking of the Time War - when you play Hamlet, and you're doing a scene about your father's death, the character you're playing has experienced this directly. The Doctor that you're playing sort of was in the Time War, but again, sort of not. We'll find out slightly more about that before the end. It won't be more explicit. But getting back to what I asked about earlier, he's had these experiences that he didn't really have. How do you access the emotions of things that Eccleston experienced in the first season, or that the previous Doctors went through? Ten is a different character from them. Yes, but he's the same man. It is a peculiar one. There's no right or wrong about it, I guess, and you pick and choose when you're the same man and when you're a different man, if we're being honest about it. Clearly, he's the same man who experienced this. He still lost every member of his own race. That doesn't change when he regenerates. That's still something he has to deal with, so I think he still feels those scars. So something that happened to Paul McGann happened just as much to you? Exactly. And when he meets Sarah Jane again, it's the same man as met Sarah Jane before. And that's how she responds to it. She might be disconcerted that he's younger, but she gets that it's the same man. Well, speaking of youth, the three of you in this modern era are a fair amount younger than most of your predecessors. Well, I'm a little younger than Chris (Eccleston), and Matt (Smith)'s a lot younger than me. Do you feel that that version of the show that Russell's created and that Steven (Moffat)'s going to carry on almost requires a younger man, just because of the physicality of it? I don't know. I think you could write the show to whoever was in the part. I don't think I'm wrong that Steven didn't intend to cast an actor as young as Matt. His instinct was to take it a bit older again. Clearly, it comes down to the actor. The Doctor can be anything, really. So I think you cast someone because they seem exciting and right and enthused and inspiring for the part, and that becomes what The Doctor is. The Doctor can be anything, and if you cast a decent actor, then he's The Doctor, and that's it - whether he's 73 or 23. There were certain archetypal episodes that Russell would do: The Doctor goes back and meets a classic English author, Doctor on a space station, etc. Were there types that you were particularly fond of as you got that point in the season? I would be fond of them all as they came up, to be honest. Because, unlike most long-running shows where you've got the police office set, and the cafe set, and you tend to visit them again, we have one standing set on Doctor Who. We have the TARDIS, and we're only in it for about a minute each week. So each episode had such a particular life about it - a particular guest cast, it looked different, we filmed them in different places - that each one lives very distinctly in my memory. We got to go to Rome to film the Pompeii one. And then some of them we would film completely in our studios in Cardiff. But each one feels distinct in my memory. The variety was absolutely the spice of it. Do you feel, having been through Comic-Con, and having seen how The Doctor is perceived at least by some people here, that having done this role might give you more of an entree to doing things here if you wanted to? Maybe. Certainly, it's been interesting being in LA for a few days, meeting people and seeing what response you get. But Doctor Who, it's a funny one. I think people who love it, love it, and are passionate about. And people who don't love it, don't even know about it. So we're in an interesting place here. And that's coming from Britain, where it's part of popular culture. I still don't quite get where we sit in American culture. But it's fun finding out. Great interview and a nice way to start the holidays. The Tennant-Stewart Hamlet was taped and will be aired in the UK on the 25th. It is supposed to air on PBS, but I don't think a date has been announced. That was such a good read - I've been looking forward to that for ages! 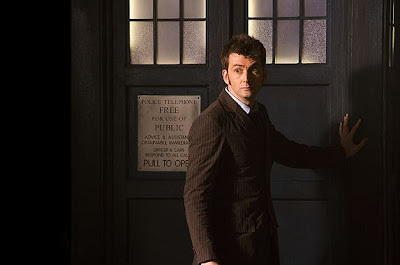 Nice to see, once again, how much David Tennant appreciates his role as the Doctor - and he's right, it's a part of our popular culture, so it means a lot that he respects the role that much. It's probably also the reason why he's so good in the role. It'll be a shame to see him go, but I'm feeling fairly confident he's going to go out in style. The Doctor is a West Wing fan! My world is making sense today. I've only just recently gotten into Doctor Who, having been caught up thanks to on demand, netflix and several marathons on BBC America and Syfy, and that bit of the interview at the end is pretty spot on. I think that most people who watch the show can't help but love it, and there are just so few who say they don't like it having seen it. The vast majority are likely unaware of it, so it's a pretty huge untapped market for this series in the US. I've tried so hard to catch up because I would hate to be late to the party. Thanks for this Alan! Thanks for the enjoyable interview, Alan. Looking forward to the concluding two-parter -- and I won't watch, or read about, the first part until I have the second ready to watch as well. What's the status with Rex is Not My Lawyer? I watched the Graham Norton Dr. Who special last weekend, and I was surprised that was Tennant's next project. He only mentioned filming a pilot (I think) though. Happy Holidays! Thanks for this, Alan. I'm so pleased that BBC America will be presenting The End of Time so soon after its UK airing. For the first time since the series returned, I'll be waiting for the American transmission to enjoy a new episode, IYKWIMAITYD. Larry, "Rex" is either still filming or has recently wrapped. Jeffrey Tambor, Jerry O'Connell and Jane Curtin are also in the cast. NBCU just signed a multi-year extension with its producers, BermanBraun, so all signs are as positive as they can be at this early stage. I shan't say anything about the actual content of the episode - but to everybody watching in America tomorrow.. you're in for a bloody treat! Thanks for asking about the youth of the more recent Doctors. I always thought the character was somewhat cheated by regenerations that didn't give him a more youthful appearance. While Tennant is my favourite Doctor, Baker is a close second. I don't think Eccleston and McGann had the role long enough to really have a chance in any of the "favourite" polls, especially McGann. I am looking forward to reading about the reactions to the first part of End of Time. It will be nice to not have to wait ages for both sides of the Atlantic to react at about the same time.